What is the only thing better than enjoying one of your own home-brewed beers straight from the tap? Enjoying two of your very own home-brewed beers straight from the tap! Kegco's HBK209B-2K Dual-Faucet Home-Brew Kegerator makes it easier than ever to store and dispense up to two kegs of homebrew beer at the same time. Whether you've been experimenting with multiple recipes, made enough beer to fill two kegs, or just want to have some variety on hand for your friends and family, this homebrew kegerator is just what you need! 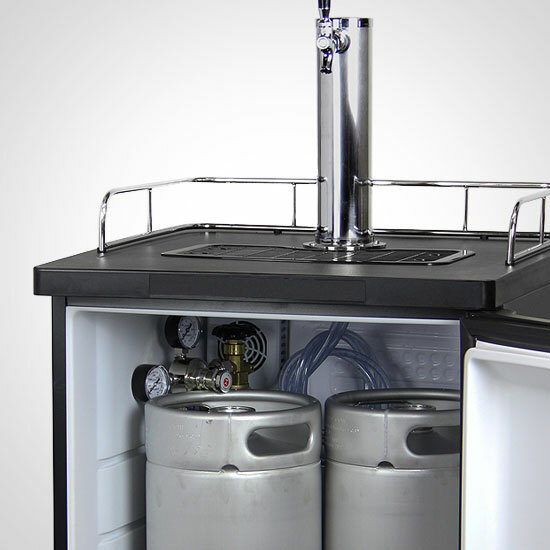 Kegco has specially designed and included a two-product home brew direct draw kit to make this kegerator even easier to use. Taking the guesswork out of setting up your brand new kegerator, this kit comes with everything you will need to be up and running in no time... we've even included the kegs! The HBK209B-2K comes with upgrades like a polished stainless steel dual-faucet draft tower, double gauge CO2 regulator with air splitter, and empty 5 lb. red aluminum CO2 tank at no additional cost to you for a value of $37. 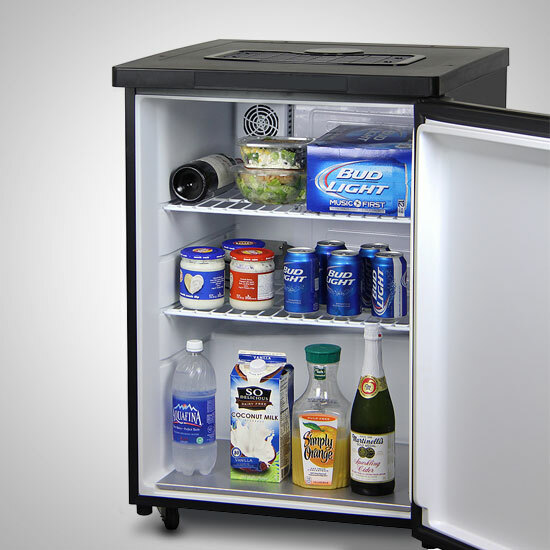 A black cabinet and stainless steel door allow this sleek and modern keg cooler to blend in effortlessly with the other stainless steel appliances that you may already have in your home. 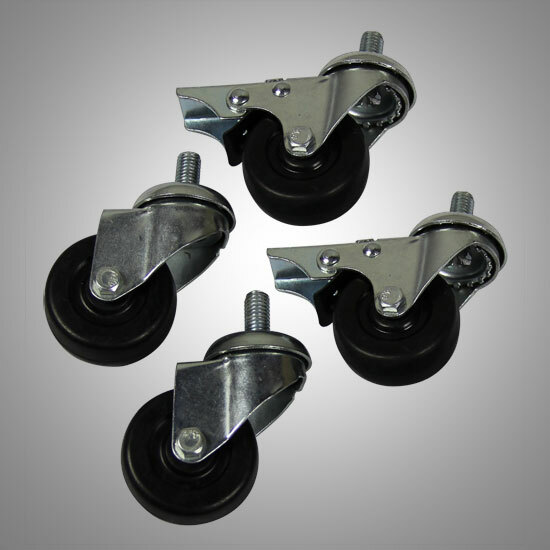 Four locking casters make it easy to move this unit around your home during parties and get-togethers, bringing your home-brewed beer to wherever it's needed. 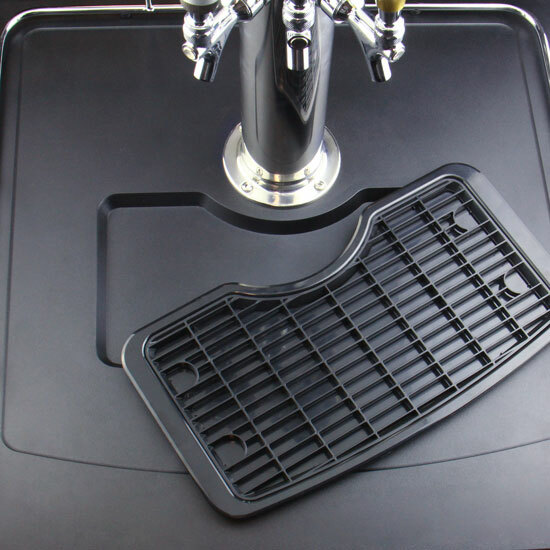 A stainless steel plate lines the bottom of the cooler, evenly distributing the weight of your kegs to prevent damage and ensure long-lasting durability. The kegerator even comes with two removable storage shelves that give you the option to convert it into a regular all-refrigerator or beverage cooler when it's not being used to dispense homebrew.